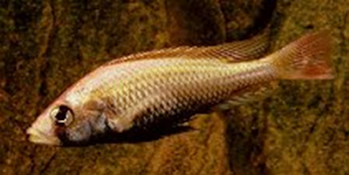 The fast expansion of the Lake Victorian Nile perch population (Lates niloticus) in the eighties and nineties of the last century coincided with the vanishing of most endemic haplochromine cichlids in the lake (Witte et al., 1992). Simultaneously, two abiotic changes occurred, namely the reduction of the oxygen content and an obscuration and spectral red-shift of the ambient light regime (Seehausen et al., 1997, 2003). During the nineties several haplochromines appeared to recover the Nile perch pressure whereas other less threatened species had extended their habitats (Witte et al., 2000). 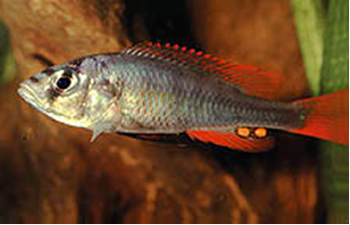 Among these were Haplochromis tanaos and H. pyrhocephalus. H. tanaos was comparatively studied with respect to its retinal morphology in relation to the environmental changes. The study revealed among others an enlargement of the long-wave sensitive double cones at the cost of the short-wave sensitive single cones which was indicated as an adaptation towards the changed light regime. Specimens from an earlier population of H. pyrrhocephalus had been shown to have extra large double cones (Van der Meer et al., 1995) and to be more red sensitive than other haplochromines (Van der Meer & Bowmaker, 1995) which could have been a pre-adaptation to its new environment. As the increase of cone-size can be functionally explained as an improvement of the photon catching ability (Van der Meer et al., 1995), the enlargement of the double cones can be interpreted as a lowering of the visual threshold for the longer wavelengths. Comparing the thresholds of H. argens and H. pyrrhocephalus revealed only a significant difference in red light (Smit & Anker, 1997), indicating the dominance of the double cones at low light levels. Another less threatened and still surviving species, H. sauvagei, has been studied in the laboratory with respect to the effects of the spectral light regime on its retinal morphology (Van der Meer, 1993). This study revealed a similar enlargement of double cones together with a decrease of single cone size when raised under dim red light whereas a dim blue light environment had no significant effect on the cone morphology. The findings, so far, affirmed the idea that the large double cones contribute to the adaptability of the fish to a changed light regime as occurred in Lake Victoria and, consequently, that they contribute to the survival of the fish during ecological changes. In other words, extinction might have been caused by the lack of this adaptability. In order to check this hypothesis, one must have the disposal of such extinct species. Although almost completely disappeared from its natural environment, H. argens still forms part of the life-stock in various laboratories. So, light dependent feeding behaviour of this species could still be investigated, together with cone morphology of colour deprived and normally raised specimens of H. argens in comparison with its close relative H. pyrrhocephalus. Adult specimens of H. argens and H. pyrrhocephalus were collected from the livestock in our department and compared with respect of their feeding behaviour under various light levels (1,7 lx – 35 lx). Measured were the reaction distance (RD) and the search time (ST). The relation between the mean RD and the various light levels was checked using one-way analysis of variance (Anovar in Statgraphics). Mean RD’s were compared between individuals and groups, using two-sample analysis results (Twosam in Statgraphics). Mean ST’s were compared between individuals and groups, using double-sided Mann-Whitney-test. Mouth-brooding females of both species were isolated and removed after three weeks when their fry were ‘free swimming’. Separate groups of larvae of both species were raised under various light conditions. One group of both species in red light (Lee 106; 5 lx; R-specimens), one group of both species in blue light (Lee 119; 5 lx; B-specimens) and one group of both species under usual laboratory conditions (150 lx; L-specimens). The conditions were described in detail in Van der Meer (1993). Adult specimens were captured, anaesthetized with 1% MS222 and preserved in 10% formalin. 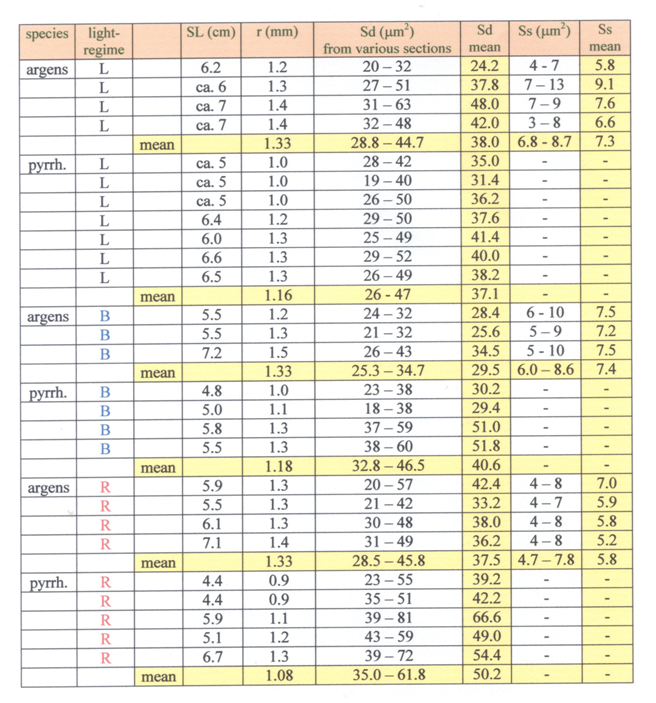 After measuring the standard length (SL; Barel et al. 1977) and the lens diameter (Van der Meer & Anker, 1984), isolated eyes were embedded in paramat and tangential sections (5 mm) were made through the dorsal, ventral, rostral and caudal part of the retina and stained according to the procedures described in Van der Meer & Anker (1986). The size of double and single cones were derived from the tangential sections through their inner segments using an eye-piece micrometer mounted on an Olympus microscope with an oil-immersion objective at a magnification of 1000x. Photopic threshold values were measured in adult B- and R-specimens using optomotor response at blue and red light according to a similar procedure as described in Smit and Anker (1997). Normally raised H. pyrrhocephalus clearly detected prey items much better at low light levels than H. argens whereas the latter species seemed to have the advantage at higher light levels. This is in agree with the former natural habitat of these species (Goldschmidt et al., 1986) and their presumed retinal resolution and sensitivity (Van der Meer et al., 1995). Further testing of the possible advantage that H. argens seemed to have under brighter light conditions was not practicable as it demanded a larger tank (increased reaction distance). The tests affirmed at least a convincing correlation between double cone size and light reduction. When raised under dim red light, the single cones in H. pyrrhocephalus had completely disappeared. The double cones of these R-specimens were significantly larger than in the normally raised specimens. A blue light regime seemed to have little or no effect on the photoreceptor development in H. pyrrhocephalus. In contrast, B-specimens of H. argens (raised in blue light) had slightly smaller double cones than the normally raised specimens, whereas the R-specimens had slightly smaller single cones. These differences were hardly significant. The single cones were practically not effected by development in blue light. Moreover, the presence of the single cones and the square pattern remained unaffected. These findings point out that the retina of H. argens reacts to dim blue and red light conditions in a contradicting way when compared to H. pyrrhocephalus and a number of other close relatives Instead of enlarging its long wave sensitive double cones at the cost of the blue sensitive single cones, a dim red environment seems to have little effect on the retina of H. argens. If this similar phenomenon acted at part during the eutrofication of Lake Victoria (Witte et al., 2005), it might as well indicate that H. argens had been unable to adapt to the changed light conditions. As its own natural microhabitat became less clear and more reddish, H. argens was more and more worsted by competition and predation and finally disappeared completely. In all comparative experiments the eyes of H. pyrrhocephalus were smaller than the eyes of H. argens. In the B-specimens no significant difference was found between the two species for the blue light thresholds. The red light thresholds were significantly lower in the B-specimens of H. pyrrhocephalus. In the R-specimens no significant difference was found between the two species for the red light thresholds, whereas the blue light thresholds were lower (but not significantly) in H. pyrrhocephalus. This result does not confirm the hypothesis that H. argens was more and more worsted by competition and predation and finally disappeared completely. Normally raised specimens of H. pyrrhocephalus clearly have lower photopic thresholds than similar specimens of H. argens (Smit & Anker, 1997; this study), among specimens raised in red light the expected significant difference in photopic threshold was not established. This may be due to the used method where discrete intervals (grey filters) were used instead of a continuous decrease of the light level. A more convincing explanation concerns the difference in eye size of the compared specimens of the two species. On all occasions the lens radius (r) of H. pyrrhocephalus was about 25% smaller than that of H. argens. As described above this has severe influence on the cone size and thus on the photopic threshold. Measurements on the ontogenetic development of cone size and photopic threshold in H. sauvagei (Van der Meer, 1994) revealed that such a decrease in cone size could easily coincide with an upraise of the photopic threshold with 0.3 log units of the illuminance threshold. If this would not only be the case in H. sauvagei but in H. argens and H. pyrrhocephalus as well, than a more significant difference between the photopic thresholds of specimens with equal eye size could be expected.